Approximately 25,000 new federal applications are published in the "Official Gazette" each month. This is the "Published for Opposition" phase near the end of the federal trademark registration process. This allows trademark owners to monitor the pending trademark applications being processed and gives you an opportunity to "oppose" the pending marks (which stops the registration process). Additionally, if there is someone out there using a mark similar to yours, and you do not take steps to stop its use in commerce, your mark becomes weaker in the eyes of the USPTO. The longer you allow another trademark to coexist with yours, whether you have made a specific decision to do so, or not, the weaker your mark becomes over time. And if you allow one mark to coexist, your ability to fight a second infringing mark is reduced, by mere existence and (tacit) acceptance of the first. 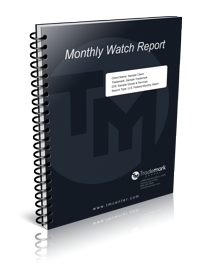 Our watching service reviews the new trademark filings each month to insure that no pending marks infringe on your mark. Our search includes close matches, phonetic matches, translations, transliterations, and anagrams covering new applications each month against your mark, in all class codes. A summary report is sent to you every month via e-mail. U.S - Monitors newly filed and published applications at the U.S. Trademark Office and monitors new filings in each of the 50 states. International - Scans new filings of international trademarks including: Canada, European Community, United Kingdom, and World Intellectual Property Organization (WIPO).